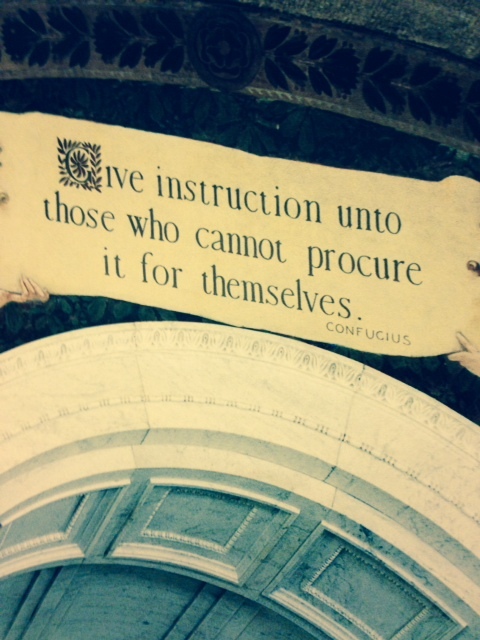 Library of Congress – …And the Truth Shall Set You Free. Today is late Carl Schroeder’s birthday—he would be 64 years old. Also, he shares the same birthday as the greatest Deaf visionary leader in America, Laurent Clerc. As for Carl to be the first person to coin American Sign Language (ASL) philosophy and ASL Storytelling Theatre. How fitting! Learning stories from Carl was one of my greatest time in my life. He lived in a beautiful and quiet town in Oregon, about 45 minutes drive from Portland, Oregon. Most of the times when he would visit Portland, he would come down to my apartment and we both would zoom to Powell’s, the largest and best bookstore in Pacific Northwest, which was five minutes from my apartment. Once when he asked me to house-sit his residence while he was away for ten days—at the same time, he said to me, “I am going to give you those books and I expect you to read and write me an essay when you’re done with it” and I was like, “Wait a minute, I thought, I did not expect like that” but looking back, I realized that he made me a better writer out of this and pushed me hard to understand philosophy than ever. Heck, he was better explaining in person than paying up for classrooms. That was how good he was. We would spend hours in there browsing books and talking about each books we would purchase—even sometimes, we would exchange books once we finish with those books. He PUSHED ME to to set up a club called American Sign Language Book Club (ASLBC), to make sure it would be in wonderful feature of humanity and begin to draw together strands from reading, reviewing, referring—and linguistics of ASL—to explain why we are so compelled to use ASL exclusively. ASLBC allows people to examine how ASL sustains our community and promotes our academia. It made many meanings. It was best times when we both were talking about books and how important public libraries are today. I was totally bummed that Carl could not make it to Washington, D.C; in November 2013—we both were about to give a lecture at Library of Congress to talk about literacy in Deaf community because we both understood what public libraries are very critical for literature. The lecture would have been awesome! Carl created thick pictures of what was going on in literature, particularly about Deaf community. There is often a symbolic relevance behind his story-telling skills, behind his descriptions of nature and life. Almost mythical. He also gives mostly physical descriptions how to challenge Audism and we end up not knowing very much about the power dynamics of Audism. He also taught me about today’s interpreters that are from an old school of thoughts, trained to view the Deaf as clients and to justify their claims of misunderstanding and other things. Professor Schroeder was phenomenal. It is OK to be controversial—it’s about challenging the oppressive society. It is important to appreciate public libraries everyday. Discover the radical new way we the Deaf people are treating our most traumatic memories with a single book. Public libraries are good for your soul! Chilly and Rainy Oregon. 2012. The picture in Library of Congress (LOC)-Thomas Jefferson Building sends a message. Gallaudet covers pretty much what literature is all about. Congress had the fundamental source of “community and continuity” that made Gallaudet the most powerful society. It reminds me of a quote, “We Americans like to think of our revolution as not being radical; indeed, most of the time we consider it downright conservative”–Gordon S. Wood. I’ve taken few good friends to visit LOC and see the message and let them think. I love doing that! This room is dedicated to those who cannot help (procure) themselves. I often wonder if it is part of learning refutes old ways of thinking. It also cancels all wrong concepts. Is there a reason Gallaudet scripted in same room as the quote scripted? That is how Congress educates itself into viewing the Deaf. We cannot procure our own instruction ourselves. See the picture below. Gallaudet represent the body of knowledge. Let’s look at the sign of GALLAUDET to imply an ongoing power struggle for the Deaf. 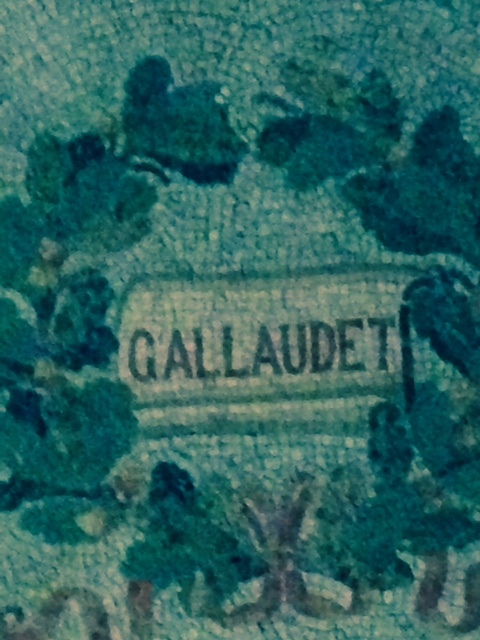 Gallaudet is appropriated by Congress so it is never Deaf-centered. From Merriam-Webster: Procure appeared into Middle English, from Anglo-French procurer, from Late Latin procurare, from Latin, to take care of, from pro- for + cura care. “To Take Care Of”—is kind of insulting for Deaf people. Humiliation will always present. It is how you handle it makes all the difference. As far as I could remember, Gallaudet University is federally funded, private university. It is a privilege, not a right. This is what the administration loves to assert: you rock the ship, and they’d best had you removed. There are hidden volumes in the library, for example, Gallaudet Archives protect the most important term on the seal. Why not? There is a vacuum in the university leadership to raise or find funds for them as long as the religious leaders are happy to see the term running on the seal today. Speaking of appropriation (budget), Gallaudet University belongs with Congress, not the Deaf. Thus, it is a privilege for the Deaf, never the right of the Deaf. The “those who cannot procure it for themselves” statement you see the photo above from Library of Congress begs for a greater development, a head-on challenge. In the other word, we can branch out our intellectual life by setting up Deaf-centered, Deaf-controlled, and Deaf-oriented University so it becomes necessarily that Deaf people can continue to make new meanings. What is the truth? In the case of “waving our language”, the truth is what we need to be proactive about our condition, namely, DEAF. The word, “DEAF” belongs to us Deaf people in the same manner that the word “THINK” belongs to IBM, and the phrase “Just Do It” belongs to Nike. I do not understand why GALLAUDET was scripted in the same room, “those who cannot procure it for themselves“. Is it an evocative of oppression the Deaf community could easily and readily identify? Perhaps it could not evolve in the university mission for the matter because of its hidden agenda that defines Gallaudet of so called “new order of Deaf people”–and it is Orwellian utopia where the Big People are watching, isn’t EPHPHATHA part of those who cannot procure it for themselves to hear? (The funny thing is that LOC is one of my favorite places to hang out and study).